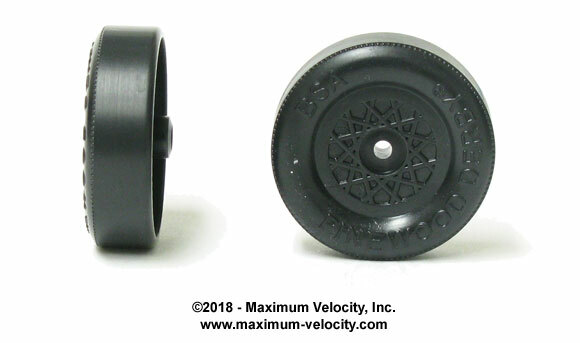 Official Cub Scout/BSA wheels which have been precision machined with True Track Tread and then reduced in weight to 1.6 grams for an ultra-fast start. 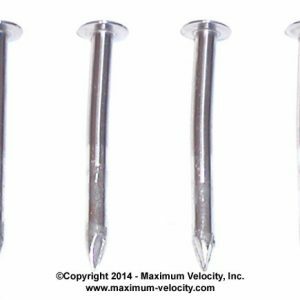 Each order includes four mold-number matched wheels with a trued tread surface. In addition, the recessed step on the outer hub is removed and coned, the bore is reamed, and the inside edge is trued. These wheels can be ran without any additional prep work. 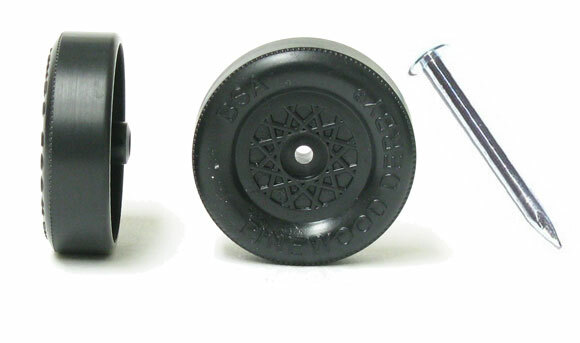 BSA pinewood derby wheels are well designed, but unfortunately the wheels vary considerably from mold to mold. Most of the wheels are not perfectly round and the tread surface is not even. 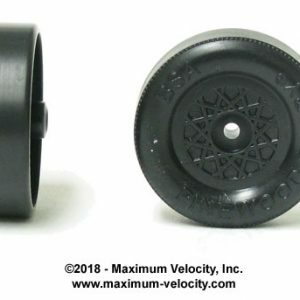 Our Ultralight Speed Wheels are official BSA wheels which are sorted by mold number, and then precision machined to tight tolerances with a HAAS CNC (computerized) lathe using proprietary fixtures and tooling. 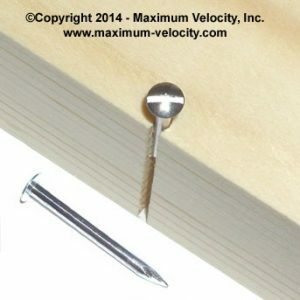 The precision of this machining cannot be duplicated on hobby lathes. The wheels are sorted by mold number, and any defective wheels are discarded. Wheel bores are reamed and bored perfectly round and smooth. The wheel tread is lathed with True Track to achieve a perfectly round wheel, a flat tread surface, and a slight radius on the edges to replicate the look of a stock BSA wheel. 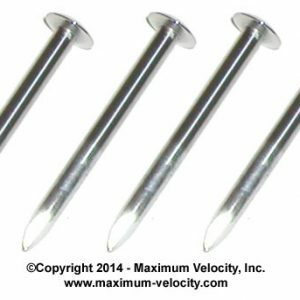 The inner edge is polished to reduce friction when rail-riding. The weight of the wheel is reduced by removing plastic from the underside of the wheel tread. 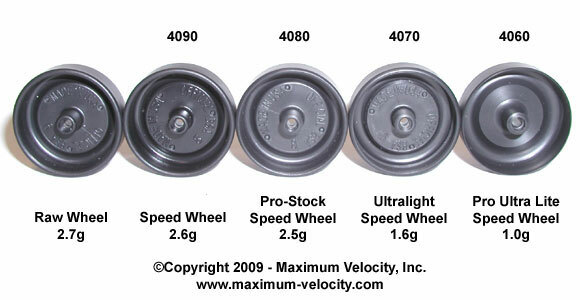 If you would like to order wheels with a particular mold number, Click Here. Round and smooth wheels roll faster than standard wheels. Matched mold numbers ensures that the bore diameter and other wheel measurements are identical, maximizing performance. The weight reduction provides a faster start, and improves the balance of the wheel for a smoother ride. 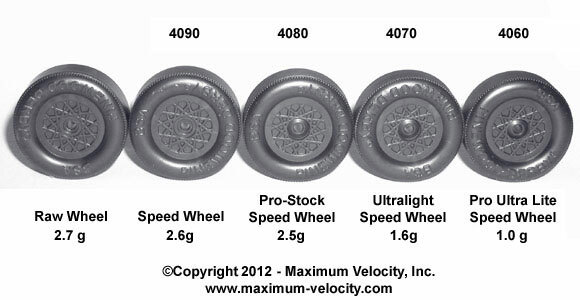 The Ultralight Matched Speed Wheels are used without any additional preparation. Optionally polish the bore with Bore Polish, then lubricate and race!